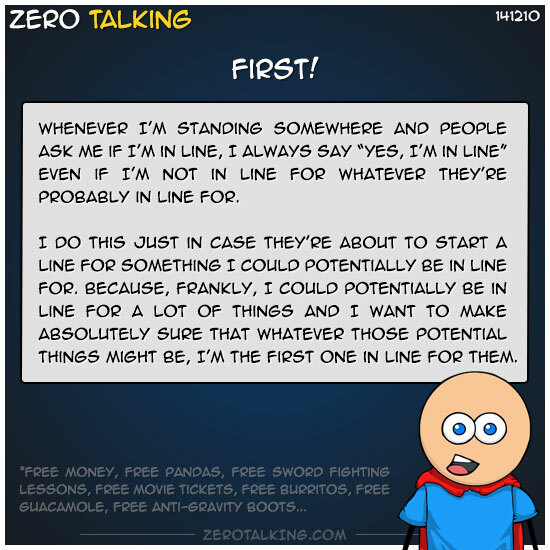 Whenever I’m standing somewhere and people ask me if I’m in line, I always say “yes, I’m in line” even if I’m not in line for whatever they’re probably in line for. I do this just in case they’re about to start a line for something I could potentially be in line for. Because, frankly, I could potentially be in line for a lot of things and I want to make absolutely sure that whatever those potential things might be, I’m the first one in line for them. Stuff like that. It’s a pretty extensive list.